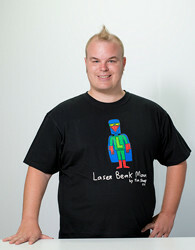 Laser Beak Man Man is the colorful superhero created by Australian artist Tim Sharp who has autism and has won fans from all around the world with his unique sense of humor and happy and very original art. Tim was diagnosed with Autism when he was three years old. Such were Tim’s enormous difficulties that the doctor's advice was "that the best thing to do was put him away and forget about him." Rejecting the prognosis, intensive therapy began immediately and bravely Tim tried to overcome what was so terrifying and difficult for him. Drawing was used as a way of helping Tim to communicate and Tim did learn to speak . At age 11 Tim invented Laser Beak Man who allows Tim to show the world his great sense of humour and intelligence as well as his original way of looking at life. A quick word from Tim Sharp.... "Hello Everybody. I love drawing Laser Beak Man it makes me happy. I was born to do this. I love having exhibitions when I get to meet lots of people and make new friends. It is a dream come true that Laser Beak Man is on TV and has his own animated series. I love being an artist and I get to travel a lot. I have been to New York, London, Sydney, Melbourne, Los Angeles, Chicago, Memphis and Nashville Tennessee. I get to make a lot of friends from all around the world. I got to do a TEDxSydney Talk at the Sydney Opera House and that is one of the best things I have ever done. I loved it! Especially when all the people stood up and cheered for me. In 2015 went to New York City to work on the Theatre Production of Laser Beak Man with Dead Puppet Society at the New Victory Theatre on 42nd Street! I love making art, doing speaking engagements, making friends and making people happy. I have a wonderful life. At age 16 Tim was the only Australian selected by a jury in the young adult drawing category for the VSA (Very Special Arts) Festival in Washington DC. Founded 30 years ago by Ambassador Jean Kennedy Smith - sister of President John F. Kennedy - VSA is the largest art festival in the world for people with disabilities. Acceptance to the festival was an extraordinary achievement and the story of Tim's trip to Washington DC was told on the ABC's "Australian Story." Laser Beak Man has his own 8 episode animated TV series screening on ABC3TV, Cartoon Network Asia, New Zealand and Australia. A world first for a young man with Autism to have his creation turned into a television series. In 2012 a short film about Tim was shown at the Metropolitan Museum of Modern Art in New York City. In August 2012 Tim traveled to Nashville Tennessee to meet friends and collaborators young rock band The Ghost Ballerinas. Tim created the artwork for their album cover and together with the band helped write the Laser Beak Man song. The I am What I Am music festival in Nashville to raise Autism awareness was commenced from inspiration from Tim and Tim attended the first festival. Brisbane landmark the William Jolly Bridge has lit up with Tim's art for Autism awareness. Exhibiting at the Sydney Opera House and the National Museum of Australia as well as Washington DC and New York, Tim's colorful art is very much in demand from international and Australian art collectors. Tim's exhibitions quickly sell out and his work is so popular that reproduction prints have been made, available on this web site, to keep up with the demand. 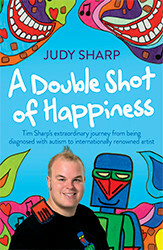 A finalist for the Young Australian of the Year, Tim has also received many awards and extensive Australian and international media coverage. Tim's 2014 TEDx talk to a capacity crowd at the Concert Hall of the Sydney Opera House received a standing ovation. Tim is enjoying working with Nicholas Paine and David Morton of Dead Puppet Society as they bring Laser Beak Man to the stage of The New Victory Theatre in New York City. Tim makes many public appearances to spread the message of ability and acceptance. He raises tens of thousands of dollars for charities each year. Art allows Tim to enjoy some of things he wants most in life, acceptance and inclusion, an encouraging word, a happy smile and friendship. Tim is an internationally acclaimed artist most famous for Laser Beak Man but also for the hope and inspiration he brings to so many people from around the world.